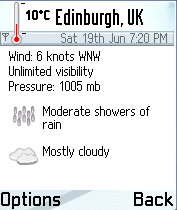 This is the main screen, showing a weather report for Edinburgh. This is the same report, but showing detailed cloud information. 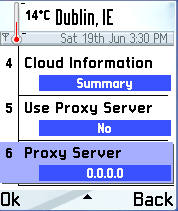 The Settings dialog allows you to configure a proxy server, change the units reports are displayed in, and choose detailed or summary cloud information. Downloading new reports will require an internet connection. To add a new location use the Edit Locations > Create New Location menu and enter a name and ICAO code. A Weather tracking program for Series 60 devices. 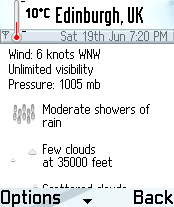 Weather is free software covered by the GNU General Public License. 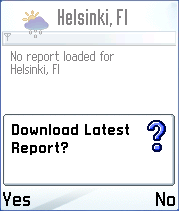 Weather allows you to download and view reports about the current weather conditions for locations all over the world. These reports are in a format called METAR and are provided by the United States National Weather Service. The reports are downloaded from the internet so you will need to have your phone set up for internet access. If you are already able to access the web with your phone, then your phone is probably sorted. The reports themselves are really small (a few hundred bytes usually) so they shouldn't run up your bill massively. That said, you are of course responsible for any call charges encurred while using Weather. If you are using a proxy server you will need to enter the proxy server address and port in the settings dialog, and to set "Use Proxy" to "yes". select the access point you will be using and then bring up the options menu and choose "Advanced settings". Write the proxy IP address and port down somewhere and put these values into the Weather settings. from the currently selected access point. When you select a location you will be asked if you want to download a new report. If you choose not to, it will just display the last report for that location. Edit Locations > Create New Location menu item. This will prompt you for the name of the location and something called an ICAO code. The ICAO code is 4 characters long and is used to identify a particular weather station. 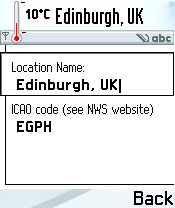 For example, "EIDW" is the ICAO code for a weather station in Dublin, Ireland. Added Dutch, Japanese and French translations. Added Finnish, Polish and Portugese translations. Added Danish translation. Fixed incorrect humidity. Added m/s to wind speed formats. Fixed some problems with the translations. Added Italian, Swedish, Romanian, Slovenian, and Chinese translations. Fixed incorrect cloud height bug. Location names are now sorted alphabetically. It works on my Nokia 6600, and I have reports of it working on the 7650, 3650, 7610, 6670, N-Gage, N-Gage QD, Siemens SX1. It should work with any phone using Symbian 6.1-7.x and S60 v1 and v2. It definitely won't work with phones using Symbian 9.x and S60 version 3. I have heard of problems with Symbian 8.x phones, the 6630 and 6680. I haven't been able to test the Chinese or Japanese translations as I don't have access to phones with those fonts installed. If you have any weird problems then send me an email and I'll see if I can help. Please check your proxy settings are correct first though!! My 6600 has finally died, so I am currently without a series 60 phone. This means there will be no more releases for the forseeable future. Weather is currently available in UK English, US English, German, Spanish, Turkish, Italian, Swedish, Hong Kong Chinese (untested), Slovenian, Romanian, Danish, Finnish, Polish and Portugese, Dutch, Japanese and French. Weather is Copyright Justin Armstrong 2004-2006. All rights reserved. Mike Prodanovic for pointing out my cloud height was completely wrong!